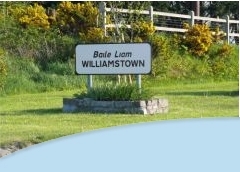 Williamstown is a beautiful scenic village located in the north east of County Galway, situated between the busy shopping towns of Tuam, Roscommon and Claremorris. Ireland West Airport, Knock is also located nearby. Williamstown was built in 1836 on the initiative of William McDermott, owner and landlord of the Springfield estate. The village enjoys a reputation for excellence, including music, drama, GAA Sport, festivals and heritage. Visitors to Williamstown are warmly welcomed with 'West-of-Ireland' hospitality. 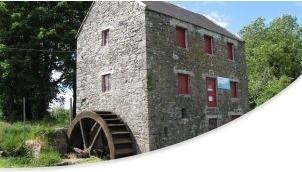 There are lots of fascinating places of interest including the holy wells at Templetogher and Beaugh, the mill and granary at Templetogher, many ringforts throughout Williamstown and the ancient roadways at Castletogher. Recreation activities include river and lake fishing, scenic walking, a modern playground for children and numerous sporting facilities. Please contact the Williamstown Development Company for more information. There is a number of projects currently ongoing and all members are asked to attend so that each of these projects can be brought up to date. New members are welcome at any time and the fact that we continue to get new members and that the work of the society continues to interest other potential members is most encouraging. Tasks are being done through a combination of voluntary work by the members of the society and the co-operation and assistance of the excellent Rural Social Scheme. 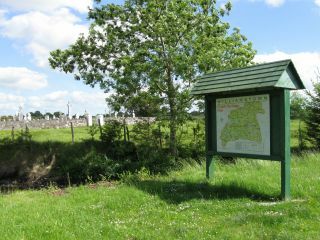 The Carrenderry Bog Road to the rear of the Parish Church is a very popular walking route for both locals and visitors alike where, in addition to its beauty, remoteness and solitude, seven attractive information boards relating to the flora and fauna of the area further enhances the walk. Now, an additional feature, in the form of a second picnic table, has been put in position at roughly the halfway point of the walk. With the main roads now so busy with traffic, it is great to have this safe and excellent walking facility on our doorstep.